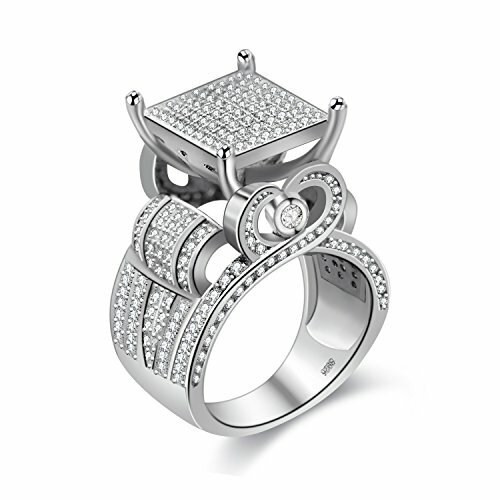 You are looking at gorgeous women's 10.8mm wide square architecture cubic zirconia stone ring suitable for engagement/wedding/mothers day and anniversary.This ring has 266 pieces of high quality 1mm round cubic zirconia stones clustered on the band, and 2 pcs of 3mm CZ stones set on two heart shape side part. It's plated with rhodium color for maximum shine and protection. Gift bag will be included. Product feature: 1.Main stone:266 pieces of high quality 1mm round cubic zirconia stones clustered on the band, and 2 pcs of 3mm CZ stones set on two heart shape side part. 2.Metal material:nickel free brass in rhodium plated color. 4.Ruturn policy:Fully refund if there is any quality problem or if you are not happy with it..
5.Intended use: mothers-day, wedding, engagement, valentines-day, anniversary, birthday, party, and christmas..
Uloveido is registered Trademark by ULOVEIDO BRAND Jewellery COMPANY,Since 2013,We regularly keep our eyes on international Fashion Jewellery,focus on the most recent trends about Jewellery designs and Styles, Our product quality is as good as those very expensive ones from Jewellery Exclusive Shops or any other retail stores, mostly even better; Rather than other reseller use low-quality metal, so it will get dark soon! ♥Main stone: 266 pieces of high quality 1mm round cubic zirconia stones clustered on the band, and 2 pcs of 3mm CZ stones set on two heart shape side part. ♥Metal material:nickel free brass in rhodium plated color. ♥Packing by nice velvet bag and another gift bracelet will be given to you too. They will be the best gift for her and yourself. ♥Return policy:Fully refund if there is any quality problem or if you are not happy with it. ♥Intended use: mothers-day, wedding, engagement, valentines-day, anniversary, birthday, party, and christmas.